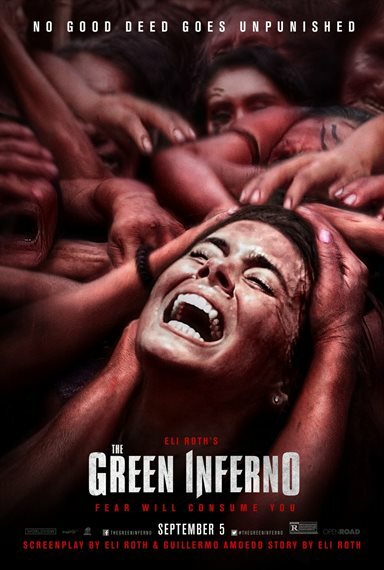 Download The Green Inferno in Digital HD from the iTunes store. The Green Inferno images are © Universal Pictures. All Rights Reserved. The Green Inferno, the latest film by Eli Roth (Hostel), was clearly inspired by Ruggero Deodato's Cannibal Holocaust. It is also clear that Roth owes a debt of gratitude to the Italian filmmaker, since he was the king of low-budget gore. Deodato's film was banned in many countries, and most people at the time were uncertain of the origin of the film and whether or not its "found footage" style was real. Unfortunately, there is little such mystique here. The film follows Justine (Lorenza Izzo), a college freshman looking to make a difference, as well as live up to her father's expectations. It doesn't make it easy on her that he is a high profile attorney for the United Nations, a fact that will be used against her, as we soon find out. The group of activists are looking for some leverage to help bring them some additional publicity. Unbeknownst to her, Justine is the perfect catalyst to help them exploit that publicity. Alejandro, (Ariel Levy) the charismatic leader of the local group, ACT, enlists the help of a group member, Jonah (Aaron Burns) to pull Justine into their cause. The group quickly travels to a remote location in Peru, and, during the trip on the river, we see a black Jaguar and are told it is the Guardian of Nature. Alejandro declares this "A Good Omen" naively, not realizing they, too, are violating the laws of the jungle with their presence. The students are brought to the campsite where they pull off the successful protest, by chaining themselves to the bulldozers and broadcasting the protest on the local, hacked, satellite network. During the protest, Justine is almost killed (set up by Alejandro to garner additional publicity), but the armed men realizing they are being filmed, stop just in time. The group is quickly removed from the location and given a flight out of the jungle, and back to civilization, only to have their premature celebrations, and plane, crash in the middle of the Green Inferno and smack dab in the middle of the local Cannibal tribe's territory. What ensues is a pretty straight forward, by-the-numbers gore-fest without any surprises. The "lost in the woods" city slickers are quickly rounded up, with the help of some seriously fast-acting sleep darts. Those that were unlucky enough not to die in the plane crash (gruesome death scenes abound in this film, and the gags are interesting in most cases) find themselves waking up in the bottom of canoes at the shore of the local tribe's territory. Madness ensues immediately as the tribe's witch-queen selects the first victim, Jonah, not coincidentally the chubbiest of the students. The butchery takes place gloriously on camera with the removal of eyes and tongue, and then he is quickly and easily dismembered and decapitated. The acting here is hit or miss at best, but some decent performances from Izzo and Levy (Levy really makes you hate Alejandro and his twisted world-view), as well as Nicholas Martinez as Daniel. Most of the actors were culled from the Eli Roth's low-budget but damn fun, ‘Aftershock' and seem to have a great rapport with each other, as well as with the director, and it shows here. I would like to have seen more footage of the jungle, to feel a more complete sense of remote, other-worldliness and dread that that kind of isolation brings to those not used to it. The Green Inferno lacks all of those things. For all of the hype and delays leading up to the film's release, I was hoping for much more from Eli Roth, but it fails to satisfy me. Even at the end, Justine makes it out of the jungle with some help from one of the local children. She lies about the events, even about the group being cannibals in order to protect them from the bulldozers. She even lies about Alejandro still being alive in order to prevent a rescue and (seemingly) ensure his comeuppance. We later find out as the credits roll, that his sister has found (convenient) Satellite footage of him, alive and still in the jungle. Possibly setting up a sequel. 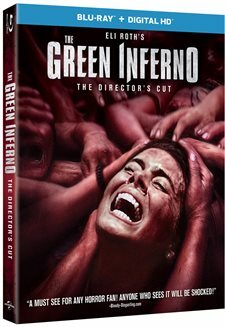 The Blu-ray presentation of The Green Inferno is presented in 1080 AVC and shows off the power of the the high definition platform with perfect colors. The jungle seems to come alive with all its vibrant colors throughout the transfer. Helping to contribute to the feeling of being "in" the story is the 5.1 DTS-HD Master soundtrack, which the envelopes the room with sounds of the jungle. Aside from a digital copy of the film for iTunes and Ultraviolet, the special features are almost non-existent on this Blu-ray except for a photo gallery and an audio commentary track with the cast and crew. The Green Inferno has many valid points to make, not least of which, about the nature of arm-chair protesters and how their need to "Trend" is more important than the subjects about which they are protesting about. Unfortunately, the movie was too predictable and absurd to be engaging and left me hungry for more.